Our service family includes people from around the world who have worked with Project OKURASE to move our programs forward and move the village of Okurase forward toward a brighter future. The Miami Valley School returned to Okurase January of 2017 to begin the Nkabom Centre Organic Garden. Project OKURASE and the people of Okurase have been fortunate to have the support of The Miami Valley School that has not only helped with several village-based projects over the last few years but also helped to raise funds for Francis Yevuga, a young boy from Okurase that is losing his vision. During the trip in January 2017, the team of teachers and students helped establish an organic garden at the Nkabom Centre. The Nkabom Centre is the community centre envisioned by the people of Okurase. The Nkabom Centre Organic Garden will serve as a source of nutrition for school children and a teaching resource for the people of Okurase. Thank you to The Miami Valley School! 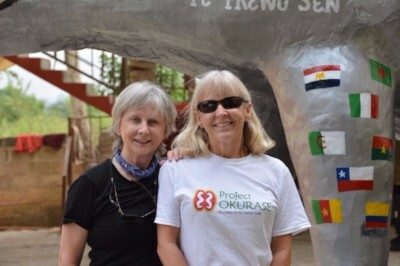 Dr. Linda Plunkett and Dr. Rene Mueller visited Okurase in January 2017. Using a standard assessment format that included personal interviews and document review, they analyzed the current status of each of Project OKURASE's programs. They also gathered information regarding businesses run by women in Okurase using a standard questionnaire and offering reading glasses as a thank you. A very welcome gift! This information is vital for Project OKURASE to ensure we continue on the right path to reach our objectives. Thank you Dr. Plunkett and Dr. Mueller for all your hard work! David and Tanya Lindsay have a unique way of honeymooning. 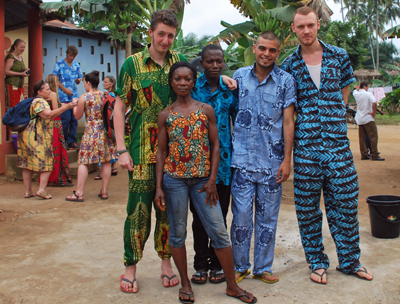 They decided to take a year off and work on helping others around the world. Project OKURASE was fortunate enough to be one of the projects they chose. David and Tanya arrived in early December 2016 and stayed through most of January 2017. They gave generously of their time and graciously with their hearts. They helped in so many ways with music, technology, education and the children. The people of Okurase, especially the children, will talk about you forever and one boy in particular, Kingsford, (and his family) has a very changed life and life trajectory. You are incredibly special people and we can't thank you enough for your time in Okurase! Working in close partnership with the District Health Directorate, Acts in Afrika, the Adeiso Health Clinic and Ghanaian and International Health professionals, we have held a Village Health Outreach (VHO) every July since 2009 in Okurase, Ghana. The 8th Annual VHO was held this year (2016). The outreach is 5 days of intensive free health services. The VHO has been a true international collaborative effort that has saved many lives. Patients come from Okurase and many surrounding villages. 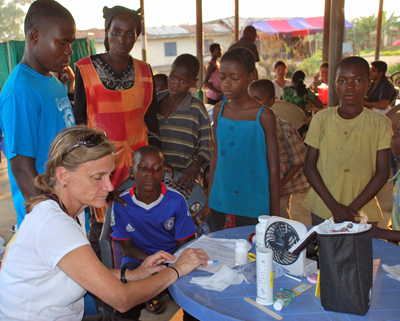 This year we saw approximately 1700 patients. Services include: vitals check and triage, examination and treatment by a physician, testing for malaria and pregnancy, wound care, reading glasses and pharmacy services. We commonly see patients with malaria, respiratory problems, skin issues, hypertension, waist pain, eye and ear infections, wounds, gastrointestinal complaints and other tropical diseases. We try each year to enroll more people in the Ghana Health Insurance Scheme. 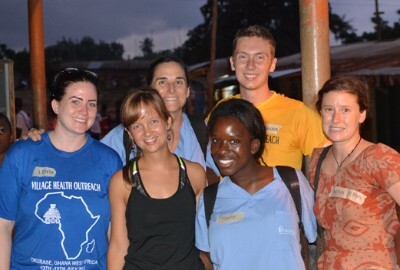 This year we had a group of students, including many nursing students, from the University of Texas at Tyler join us. Londa Jensen and her students were instrumental in collecting all the supplies for the VHO and getting them to Ghana for us. We couldn't have done it without them! A special thank you to Londa and her team for all their efforts in gathering these supplies and thank you to everyone who help with this year's VHO! 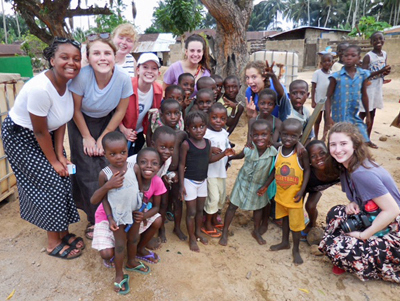 Students and leaders from Minnehaha Academy joined us in Okurase in March of 2016. They worked with the village schools and elders to launch – DI WO MANTEM NI – OKURASE RECYCLES. Recycling bins were placed in the schools, at the Marketplace and throughout the community with stickers denoting the name of the program. The program name and logo were developed jointly by Okurase and the students. The Minnehaha students and teachers worked together to provide information to children about recycling. Information was also given out around the community. The students also brought equipment to restore a futbol field at a local school and gear for the futbol players. They mowed, clean and lined the field. They even made a net out of recycled water sachets. It was a lot of work but they were able to enjoy being part of a game at the end. Their efforts will be forever remembered by the Village. Thank you Minnehaha Academy! 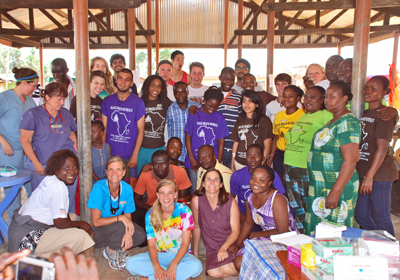 Working in close partnership with the District Health Directorate, Acts in Afrika, the Adeiso Health Clinic and Ghanaian and International Health professionals, we have held a Village Health Outreach (VHO) every July since 2009 in Okurase, Ghana. The 7th Annual VHO was held this year (2015). The outreach is 5 days of intensive free health services. The VHO has been a true international collaborative effort that has saved many lives. Patients come from Okurase and many surrounding villages. This year we saw approximately 1500 patients. Services include: vitals check and triage, examination and treatment by a physician, testing for malaria and pregnancy, wound care, reading glasses and pharmacy services. We commonly see patients with malaria, respiratory problems, skin issues, hypertension, waist pain, eye and ear infections, wounds, gastrointestinal complaints and other tropical diseases. We try each year to enroll more people in the Ghana Health Insurance Scheme. This year we were fortunate to have two massage therapist join the VHO and provide therapeutic massage for the first time. It was a significant addition to the VHO. With all the hard physical labor of the work performed in Okurase, so many people suffer from issues that are particularly helped by therapeutic massage. We are so glad that Cathy and Louise joined us this year. In addition, 4 people who came to our VHO create the Okurase Library and worked with village children to write a book. We are so glad Wendy, Joelie, Ciro, and Richeline join us. Thank you to everyone who help this year's! 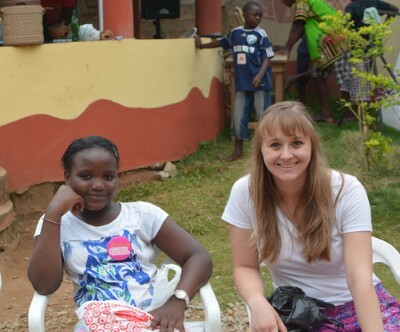 In 2015, Maggie Panetta, spent 10 weeks in Okurase as an Intern for Project OKURASE. Maggie tackled administrative work for Project OKURASE in Ghana and then helped to establish the procedures for the newly formed Okurase Library. Then a librarian was hired and Maggie trained her in the set-up of the library. Thank you Maggie for working so hard to help the people of Okurase! 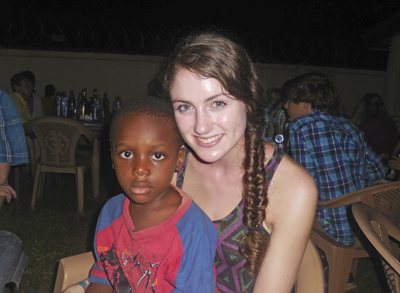 Shannon McGue and John McGue spent 8 weeks in Okurase during the summer of 2015. 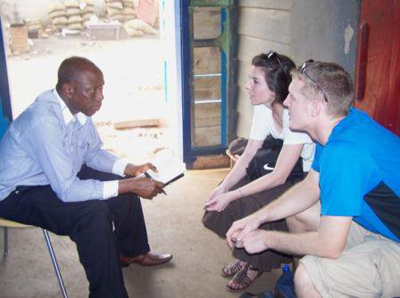 Shannon worked with the Project OKURASE Project Coordinator in Ghana on revising our bookkeeping procedures. She also conducted a great many interviews with different people throughout Okurase to understand what should be the focus of the Nkabom Centre Skills Training School that was nearing completion. John worked in the Electronic Classroom. He inventoried equipment, created new procedures, assisted with hiring personnel and training the teachers using the Electronic Classroom. Thank you Shannon and John for working so hard to help the people of Okruase. As a result of the Possibilities Without Borders activities, 4 students from the College of Charleston became interested and took an internship to work in Okurase for a 4 month period. They worked with the village to revamp the community organic garden and develop a system for watering the garden. The interns tutored local youth, taught computer classes, worked on the community garden, assisted with business operations of a local women's cooperative that makes a food called gari and created procedure documents to help with basic functions of Project OKURASE. They also worked with a local engineer and physicist to explore a biogas system for managing waste and cooking and began a pilot. This system leaves no carbon footprint. The system is 3-prong - it is a toilet that converts waste to biogas and it is used for cooking. The third prong coverts the waste to organic fertilizer which is used to fertilize a food forest. Thank you Michelle, Chase, Alex and Sam for all your hard work! Working in close partnership with the District Health Directorate, Acts in Afrika, the Adeiso Health Clinic and Ghanaian and International Health professionals, we have held a Village Health Outreach (VHO) every July since 2009 in Okurase, Ghana. The 6th Annual VHO was held this year (2014). The outreach is 5 days of intensive free health services. The VHO has been a true international collaborative effort that has saved many lives. Patients come from Okurase and many surrounding villages. This year we saw approximately 1300 patients. Services include: vitals check and triage, examination and treatment by a physician, testing for malaria and pregnancy, wound care, reading glasses and pharmacy services. We commonly see patients with malaria, respiratory problems, skin issues, hypertension, waist pain, eye and ear infections, wounds, gastrointestinal complaints and other tropical diseases. We try each year to enroll more people in the Ghana Health Insurance Scheme. Thank you to everyone who help with this year's VHO! 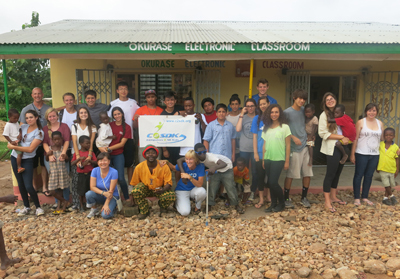 Students and leaders from La Jolla Country Day School came to Okurase in 2014 and help us create the Okurase Electronic Classroom. They brought 15 refurbished laptops, build computer desks, brought supplies and painted. The Okurase Electronic Classroom was born and is actively being used today. This classroom has been a significant educational resource for Okurase and other villages. Thank you La Jolla Country Day School! 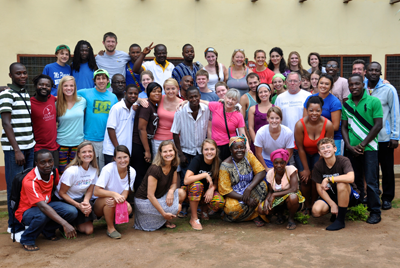 Students and leaders from the College of Charleston in South Carolina, USA traveled to Okurase in May of 2014. They painted, cleaned and educated school children on the importance of clean water and hygiene. They also spoke with some small businesses to discuss the way forward for the owners. Thank you for your help! 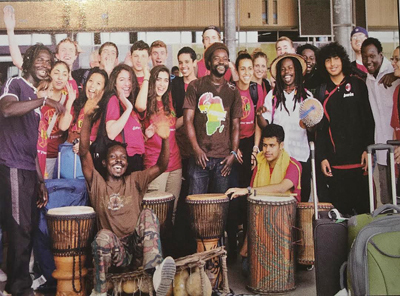 The Miami Valley School from Dayton, Ohio in the United States came to Okurase for the first time in 2014. 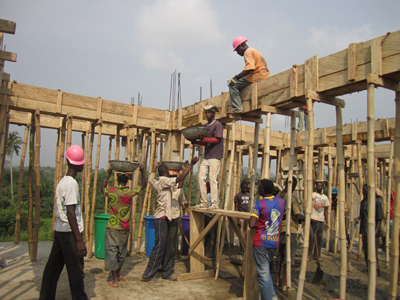 They helped build the base of the Medical Centre in the Nkabom Centre. They also helped with the drainage system, the garden at Nkabom Centre and taught in the local schools. Thank you to The Miami Valley School!! 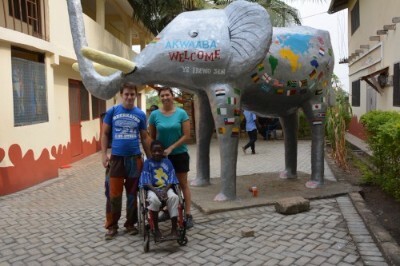 Jake Schneck came to volunteer in Okurase to help us with building the Nkabom Centre. 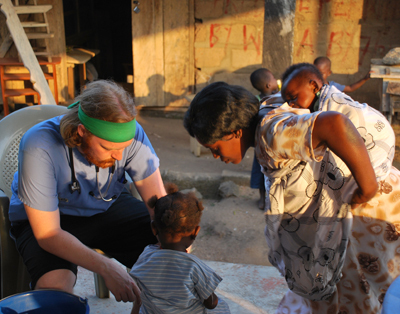 During his time in Okurase, the foundation for the Medical Clinic was created. Thank you Jake! 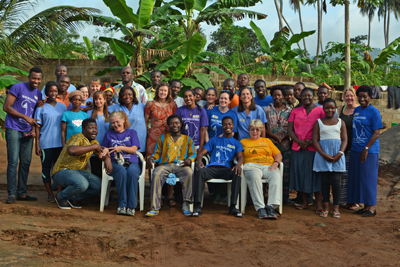 A group of Gethsemani Quilters from Charleston, South Carolina traveled to Okurase in 2013. They spent a week teaching and making a community quilt. 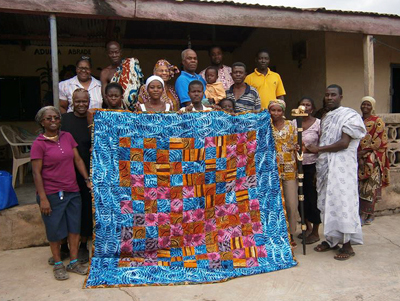 The quilt that was made will be displayed in the Nkabom Vocational Training Institute when it opens. Thank you Gethsemani Quilters! In 2013 Eden Katz served as a College of Charleston intern for Project OKURASE. The topic she tackled was community waste. In Okurase there are 6 mountains of waste, mostly plastic, that have accumulated over time to be higher than some roof tops. Eden reviewed literature, interviewed people in the U.S. and Ghana and presented a very well done research paper with recommendations to begin to tackle the waste problem. She has gone on to work in multiple countries in west and east Africa. In addition, Eden helped research and establish the Internet service in the Okurase Electronic Classroom as well as worked as an intern in the Project OKURASE Charleston, SC, USA office. Thank you Eden for all that you have done for Project OKURASE and the people of Okurase! 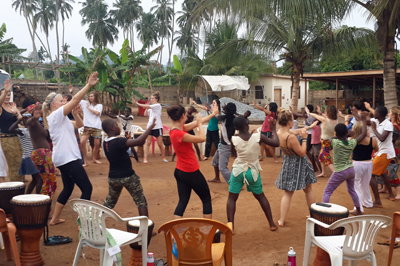 Working in close partnership with the District Health Directorate, Acts in Afrika, the Adeiso Health Clinic and Ghanaian and International Health professionals, we have held a Village Health Outreach (VHO) every July since 2009 in Okurase, Ghana. The 5th Annual VHO was held this year (2013). The outreach is 5 days of intensive free health services. The VHO has been a true international collaborative effort that has saved many lives. Patients come from Okurase and many surrounding villages. This year we saw approximately 1200 patients. Services include: vitals check and triage, examination and treatment by a physician, testing for malaria and pregnancy, wound care, reading glasses and pharmacy services. We commonly see patients with malaria, respiratory problems, skin issues, hypertension, waist pain, eye and ear infections, wounds, gastrointestinal complaints and other tropical diseases. We try each year to enroll more people in the Ghana Health Insurance Scheme. Thank you to everyone who help with this year's VHO! 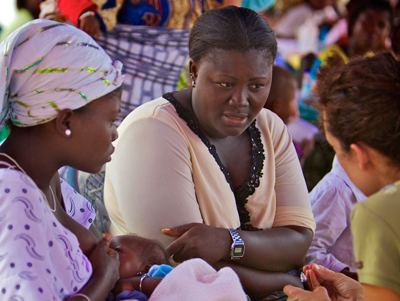 Working in close partnership with the District Health Directorate, Acts in Afrika, the Adeiso Health Clinic and Ghanaian and International Health professionals, we have held a Village Health Outreach (VHO) every July since 2009 in Okurase, Ghana. The 4th Annual VHO was held this year (2012). The outreach is 5 days of intensive free health services. The VHO has been a true international collaborative effort that has saved many lives. Patients come from Okurase and many surrounding villages. This year we saw approximately 1200 patients. Services include: vitals check and triage, examination and treatment by a physician, testing for malaria and pregnancy, wound care, reading glasses and pharmacy services. We commonly see patients with malaria, respiratory problems, skin issues, hypertension, waist pain, eye and ear infections, wounds, gastrointestinal complaints and other tropical diseases. We try each year to enroll more people in the Ghana Health Insurance Scheme. Thank you to everyone who help with this year's VHO! Joe, Leeor and Lucas from University of Leeds in England came to Okurase for 6 weeks during the summer of 2012. They taught classes at the local schools, photographed for Project OKURASE, and helped us get ready and run our Annual Village Health Outreach. It was an incredible help having them in the Village. Thank you Joe, Leeor, and Lucas! 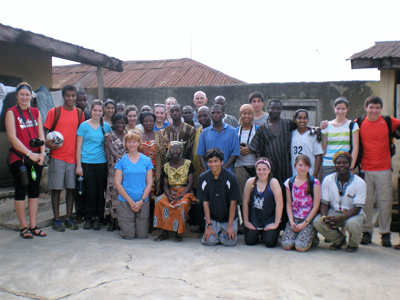 Students and leaders from La Jolla Country Day School came to Okurase in 2012. 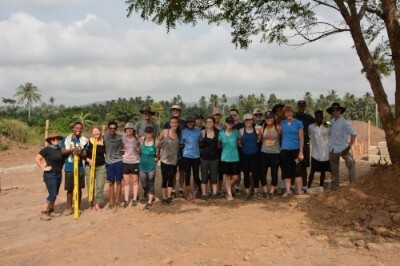 They helped with construction, painting and teaching. Thank you La Jolla Country Day School! Students from the American International School from Riyadh, Saudi Arabia visited Okurase in 2012. They helped make bricks for constructing buildings, they painted and some became teachers for the local children. During the day they worked hard on their assigned projects, right along side the village residents. They made a lot of bricks, painted the school with the colors of the Ghanaian flag and etched traditional symbols on the walls, and taught the village children many new things. In the evening, there was time to rest and embrace the culture and hospitality of the locals. A comment from a student: “The trip changed me by giving me an insight on how much poor people suffered, and how they managed to adapt to their difficult lifestyle. I also realized just how difficult manual labor is and how physically stressful it was,” says Numair Belgaumi an AISR alum. Thank you to the AIS-R school for all their work! Working in close partnership with the District Health Directorate, Acts in Afrika, the Adeiso Health Clinic and Ghanaian and International Health professionals, we have held a Village Health Outreach (VHO) every July since 2009 in Okurase, Ghana. The 3rd Annual VHO was held this year (2011). The outreach is 5 days of intensive free health services. The VHO has been a true international collaborative effort that has saved many lives. Patients come from Okurase and many surrounding villages. This year we saw approximately 1000 patients. Services include: vitals check and triage, examination and treatment by a physician, testing for malaria and pregnancy, wound care, reading glasses and pharmacy services. We commonly see patients with malaria, respiratory problems, skin issues, hypertension, waist pain, eye and ear infections, wounds, gastrointestinal complaints and other tropical diseases. We try each year to enroll more people in the Ghana Health Insurance Scheme. Thank you to everyone who help with this year's VHO! Clif Edwards was Project OKURASE’s first intern. 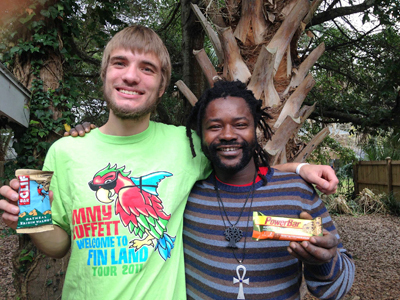 He was majoring in Public Health with a minor in African studies at the College of Charleston. 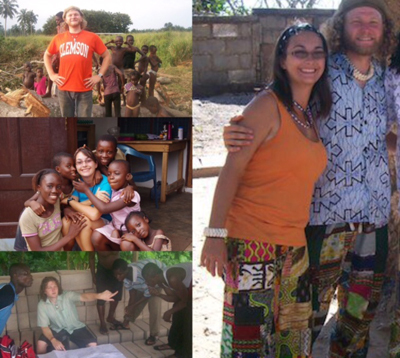 Clif had already been to Ghana in 2006 with Djole and his family before Project OKURASE was formed. He came to Ghana for internship in 2011 to work as an assistant to the physicians in the very early years of the Village Health Outreach. He returned the next year to again lend medical support. Here he is pictured with Powerful. Thanks Clif for all the support you have given Project OKURASE and the people of Okurase. The design for the Nkabom Centre in Okurase, Ghana was completed by the Clemson Architecture Center at Clemson University. 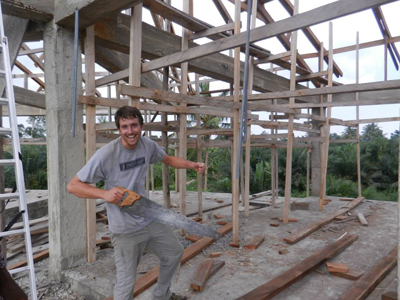 The graduate student, Chris Moore, who was the lead on the project came to Okurase in 2010 to help start the first building, the vocational school. His wife, Evan Moore, came with him. Chris and Evan stayed in Okurase for 8 weeks. Chris worked on the vocational school and Evan helped and also worked with the kids in the village on dancing and drumming. The school will be completed in 2017. We will be forever thankful for their work. 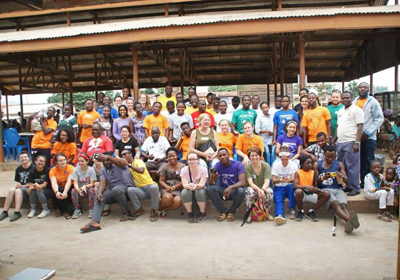 Working in close partnership with the District Health Directorate, Acts in Afrika, the Adeiso Health Clinic and Ghanaian and International Health professionals, we have held a Village Health Outreach (VHO) every July since 2009 in Okurase, Ghana. The 2nd Annual VHO was held this year (2010). The outreach is 5 days of intensive free health services. The VHO has been a true international collaborative effort that has saved many lives. Patients come from Okurase and many surrounding villages. This year we saw approximately 1000 patients. Services include: vitals check and triage, examination and treatment by a physician, testing for malaria and pregnancy, wound care, reading glasses and pharmacy services. We commonly see patients with malaria, respiratory problems, skin issues, hypertension, waist pain, eye and ear infections, wounds, gastrointestinal complaints and other tropical diseases. We try each year to enroll more people in the Ghana Health Insurance Scheme. Thank you to everyone who help with this year's VHO! 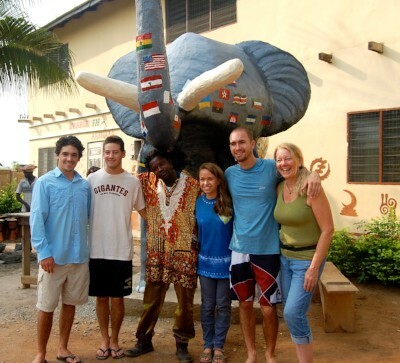 In January 2009, two graduate architecture students from Clemson University in South Carolina, USA, Kyle Keaffaber and Lindsey Waters traveled to Ghana with Dr. Cynthia Cupit Swenson and met Samuel Yeboah. They spent 10 intensive days interviewing architects, walking the land, studying the direction of the wind, the flow of water, taking samples, investigating materials, and learning Ghanaian culture. They returned to Clemson and brought the information back to their 2 innovative professors, Robert Miller and Ray Huff and 12 other students. The team spent 4 intensive months researching and developing the design for the Nkabom Centre, a community centre for the people of Okurase, with weekly meetings attended by Dr. Swenson and presentations that were sent to the village for regular feedback and approval. The design was completed on May 4, 2009 and presented in the form of an exam given by experienced architects in South Carolina and attended by Drs. Swenson and Yeboah. The final design was approved by Okurase leadership and given to the people of Okurase. We are so appreciative of the work that was done and excited to announce that the first building at the Nkabom Centre will open in 2017. Thank you for enabling us to get to this point! Working in close partnership with the District Health Directorate, Acts in Afrika, the Adeiso Health Clinic and Ghanaian and International Health professionals, we have held a Village Health Outreach (VHO) every July since 2009 in Okurase, Ghana. The 1st Annual VHO was held this year (2009). The outreach is 5 days of intensive free health services. The VHO has been a true international collaborative effort that has saved many lives. Patients come from Okurase and many surrounding villages. This year we saw approximately 1000 patients. Services include: vitals check and triage, examination and treatment by a physician, testing for malaria and pregnancy, wound care, reading glasses and pharmacy services. We commonly see patients with malaria, respiratory problems, skin issues, hypertension, waist pain, eye and ear infections, wounds, gastrointestinal complaints and other tropical diseases. 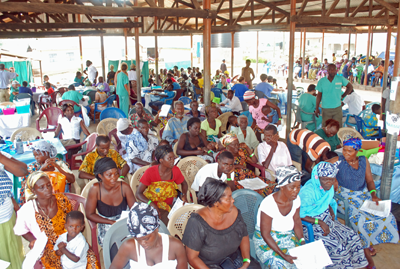 We try each year to enroll more people in the Ghana Health Insurance Scheme. Thank you to everyone who help with this year's VHO!